If you look close enough, she also has another specific identifiable feature, she is missing the tip of her lower caudal fin. We first met Mimi in 2016 when she was only around 10ft in length. Despite her size, her strong personality made her one of our favourite sharks very quickly. 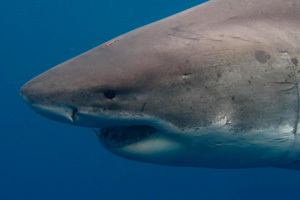 She was famous for hanging back when the bigger sharks were around but as soon as they departed she wouldn’t hesitate in rushing in and often snagging herself a free meal. She was small, smart and bursting with energy! By 2017 she had grown into a healthy 14ft future mega shark of Guadalupe. This season she really made a name for herself, being one of the most consistently seen and exciting sharks our guests were meeting. Often lunging on the baits and completely breaching clear of the water, she can make our divers dizzy in the water trying to keep up with her! 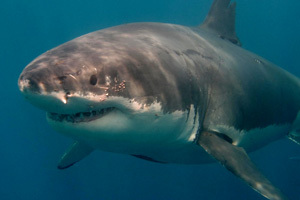 It is estimated that Great White sharks can grow between 2-4 ft per year when in the earlier portion of their lives. Screaming Mimi is living proof of this as she was around 10ft in 2016 and had bulked up to around 14ft the following year. 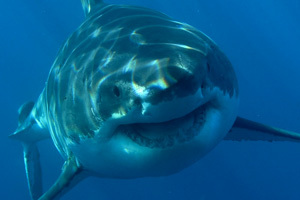 Some sharks we see seem to grow fast and others slow….why could this be? Could it be genetic or perhaps the faster growers are the more successful hunters of food. Mimi is certainly a shark to keep an eye on in future seasons as at the rate she is growing she could easily become one of our classic “mega sharks” fast! Share the Screaming Mimi the shark love on Facebook! Want to meet Screaming Mimi? Book with Shark Diving Xperts today!